The interface of the RadEditoris "Level AAA" accessible (in compliance with the W3C Web Accessibility Guidelines 2.0). The control is also Section 508 compliant. Verified with the HiSoftware Compliance Sheriff automated content compliance tool. 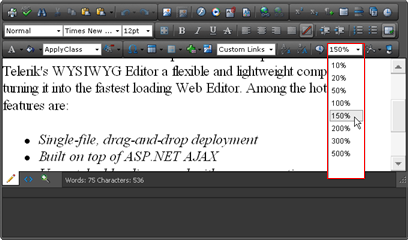 RadEditor passes the check of the W3C accessibility validator (click the W3C logo on one of the on-line examples). Verified with the HiSoftware Compliance Sheriff automated content compliance tool. 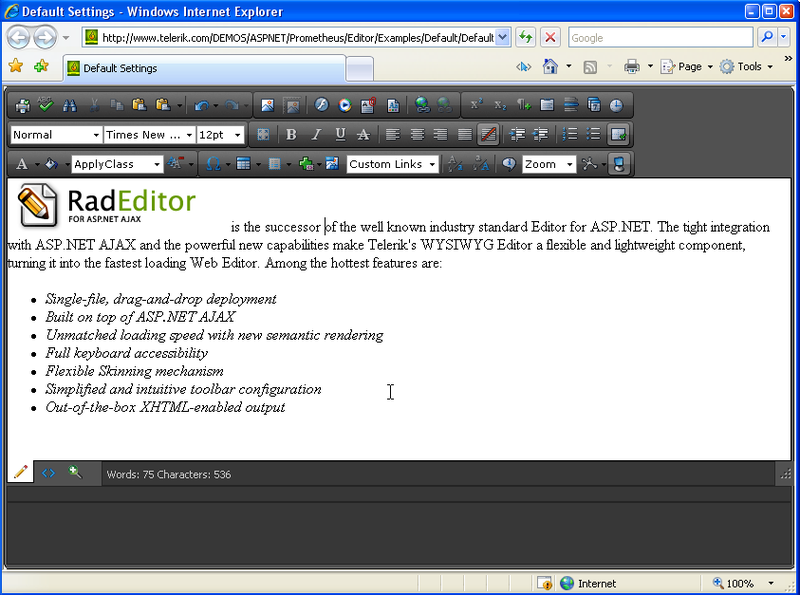 Semantic rendering - helps the screen readers and alternative browsing devices to read and interpret the content easier. RadEditor offers title attributes for all tools. Keyboard Shortcuts - All tools and commands can be associated with shortcuts either with a property of the object or in the ToolsFile.xml file. You can find more information in the following help article: Keyboard Shortcuts. Toolbar optimization - when the ToolbarMode property is not set to "Default", but for example to "ShowOnFocus" then the editor's tools are initialized at the moment of displaying, but not on page load. ToolProviderID - this property helps significantly reduce the HTML markup and JSON sent from server to the client when multiple RadEditor objects with the same tools are used on the same page. 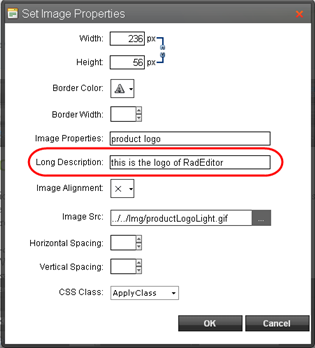 The ToolProviderID should be set to the ID of another RadEditor, e.g. AccessKey - This accessibility property sets a keyboard shortcut key to access the content area of RadEditor, e.g. 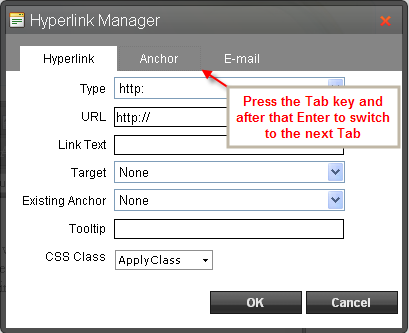 Note: In Internet Explorer use Alt + AccessKey to give focus to the element with a specified access key. To activate an access key in Firefox 2.0 use Shift + Alt + AccessKey. Full keyboard accessibility - RadEditor is a fully keyboard navigable component, including shortcuts to open and operate with drop-downs, tools and dialogs, achieving true accessibility. 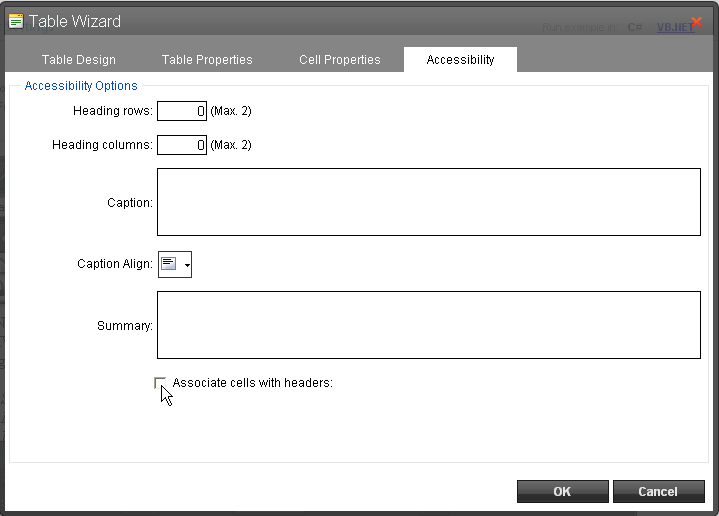 Navigatable dropdowns - RadEditor also provides the ability to navigate dropdown items as well. Press enter to execute command. 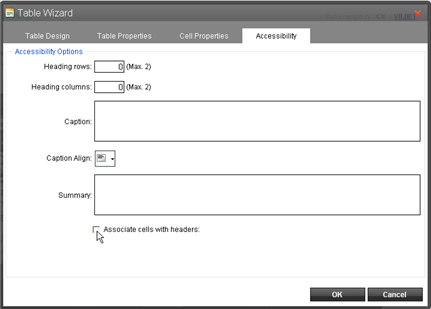 Dialogs accessibility - ability to switch dialog tabs with keyboard and to navigate dialog controls with Tab. You can switch to the next tab by clicking TAB and after that Enter. You can navigate through the elements in the Dialog using the TAB key. Optional accessibility settings according to W3C WAI and Section 508 Accessibility Guidelines - the content generated by the RadEditor can become accessible if the author fills in all required fields (marked with a special accessibility icon - Section 508). OnClientPasteHtml - The OnClientPasteHtml event is useful in scenarios where the developers need to examine or modify the HTMl to be pasted by an editor tool before it is inserted in the editor content area. Using this event the developer can enforce the creation of accessible HTML/XHTML content. Custom skins - RadEditor offers the ability to create custom skins with more accessible appearance (e.g. larger buttons, high-contrast colors, etc.). 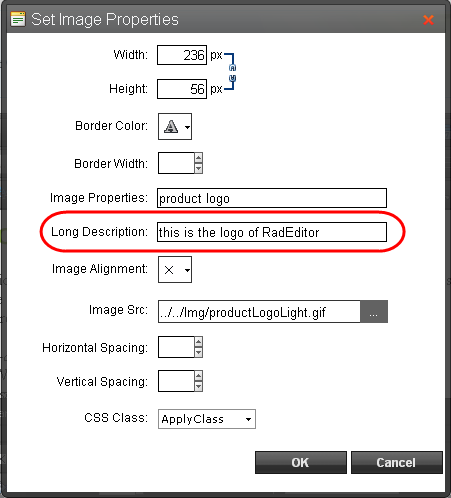 You can find more information how to make your own custom skin in the following help articles: Creating a custom skin and Creating Custom Skin for RadEditor.